Angelina Jolie (born Angelina Jolie Voight on June 4, 1975 in Los Angeles, California). Jolie is the daughter of actors Jon Voight and Marcheline Bertrand. She is the niece of Chip Taylor, sister of James Haven and the god-daughter of Jacqueline Bisset and Maximilian Schell. On her father's side, Jolie is of Czechoslovakian and German descent, and on her mother's side she is French Canadian and is said to be part Iroquois. However, Voight has claimed Bertrand was "not seriously Iroquois", and they merely said it to enhance his ex-wife's exotic background. is an American actress and Goodwill Ambassador for the UN Refugee Agency. She has received three Golden Globe Awards, two Screen Actors Guild Awards, and an Academy Award. Jolie has promoted humanitarian causes throughout the world, and is noted for her work with refugees through UNHCR. She has been cited as one of the world's most beautiful women and her off-screen life is widely reported. At the age of 14, she had dropped out of her acting classes and dreamed of becoming a funeral director. During this period, she wore black, dyed her hair purple and went out moshing with her live-in boyfriend. Two years later, after the relationship had ended, she rented an apartment above a garage a few blocks from her mother's home. She returned to theatre studies and graduated from high school, though in recent times she has referred to this period with the observation, "I am still at heart-and always will be-just a punk kid with tattoos". Surely the most popular tattooed female celebrity in the world today has to be Angelina Jolie. This gifted actress, who is blessed with stunning good looks, has at the very least, a dozen tattoos, and shows no signs of slowing down her collecting. Her tattoos are a reflection of her personality, exotic and with more than just a hint of dangerous sensuality. This is a babe with an edge and a true ink aficionado. A woman who professes she likes to play with knives in bed and had the name of the man she loved tattooed on her. And when he exits stage left, she doesn't hesitate to have it lasered off just as quickly. "I collected knives and always had certain things around. For some reason, the ritual of having cut myself and feeling the pain, maybe feeling alive, feeling some kind of release, it was somehow therapeutic to me." Jolie has hundreds of web sites dedicated to her worship and her popularity shows no signs of waning as she continues to put her own personal spin on the genre of female action-stars. The story of the tattoos that are draped on the body of box office hitmaker and baby mama Angelina Jolie are a story in themselves, but this week one artist is spilling on a session with Jolie that was a bit girly. 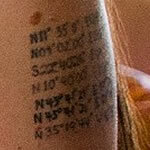 It doesn't include Brad Pitt but there is a bit on Angie's former husband Billy Bob Thornton and Jolie's tan lines. According to a Life & Style Weekly report, "famed celebrity tattoo artist Friday Jones - who once gave Angelina Jolie a tat in a very private place - is opening Friday Jones Fifth Avenue at Senses NY Salon & Spa on June 16." She spoke with the magazine. "I always thought we could have a more serene, spiritually driven approach to tattooing," Friday, who notes that Angelina was one of her inspirations for the posh-parlor concept, tells Life & Style. "I met Angie right around 2000. She was this edgy, avant-garde girl. She would pull up to the house and say, 'I'm jonesing for a tattoo - you have to tattoo me.' And we're up in the house in the Hollywood Hills, she has her little glass of wine, it's very calm. It's a good atmosphere to stretch out and feel like girls." But the item notes when Angelina, 34, asked Friday to mark her with the name of then-lover Billy Bob Thornton, Friday did have some reservations, she admits. "I was like, 'I'm not going to put that man's name on you,'" she says. "Eventually, after about two or three weeks of her coming over every day, I broke down. We put his name very delicately on her bikini line." 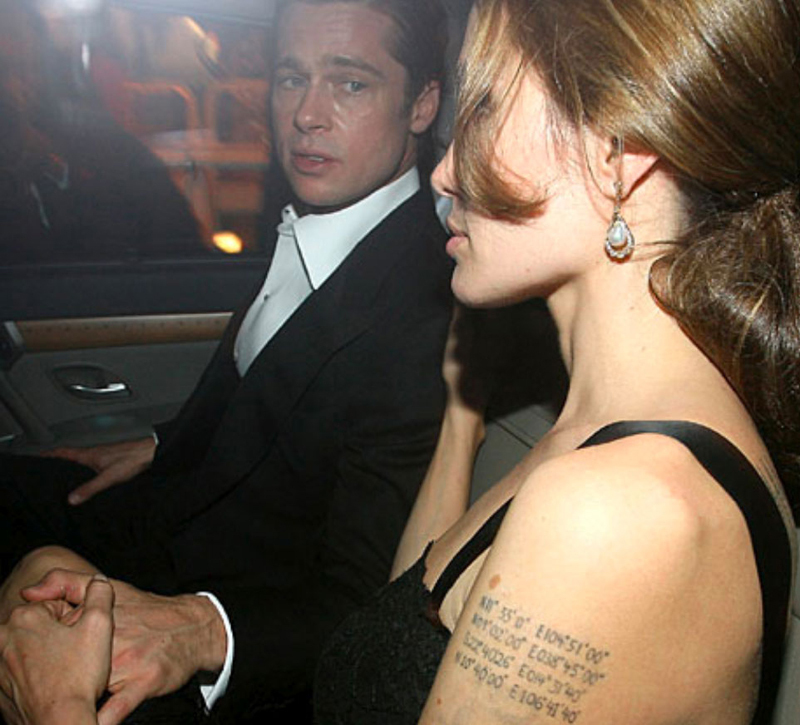 Angelina Jolie had the cross tattoo done the day before she married Johnny Lee Miller in 1995. In her own words: "It was all symbolic, and it was a good thing, nothing dark." One of her latest tattoos is on her inner thigh done... "Um, it's for Brad". 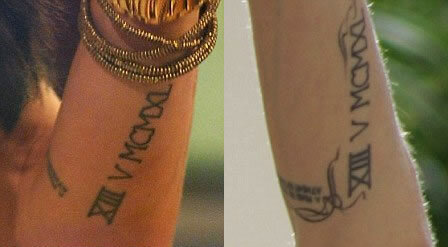 See Angelina's tattoos from the movie WANTED! 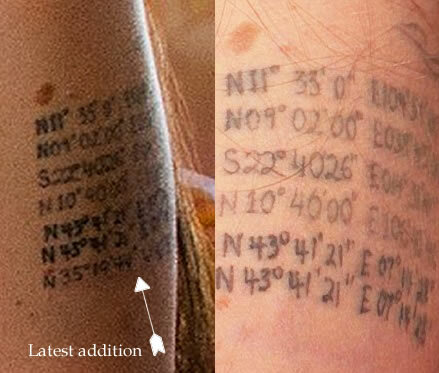 Want to find out what some of Angelina Jolie's tattoo designs & symbols mean?